DUMBARTON reached the fifth round of the William Hill Scottish Cup for the first time since 1984 with a comfortable win away to Berwick Rangers. A crowd of just over 400 at chilly Shielfield Park saw the wee Rangers take the lead with a stunning free kick by Lee Currie, and this shocked Sons into action. 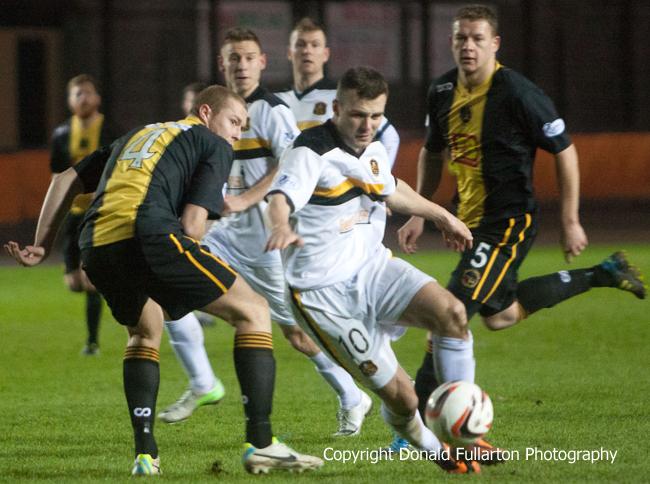 A Mark Gilhaney cross was handled in the box, and the resultant spot kick allowed Bryan Prunty to equalise. Soon after Mitch Megginson burst through and sent a blistering low shot past keeper Billy Bald and into the far corner of the net. Playing down the quite pronounced slope in the second half the visitors took control. In the 55th minute full back Scott Linton broke into the box and netted no.3. Berwick tried hard to pull one back, but mostly it was procession towards their goal. Two shots hit the bar, Colin Nish had a goal chalked off for handball, and several other efforts came close. The picture show Kevin Smith shooting.